The full OB Planning Board. From L to R, sitting, Seth Connolly, Jane Gawronski, Scott Therkalsen, Mike Nieto, Drew Wilson, Rae Hartigan, Tom Gawronski, Chair Pete Ruscitti, John Ambert, Dan Dennison, Andrew Waltz, Valeria Pas, Kevin Becker, and Robert Shamoun (in red). 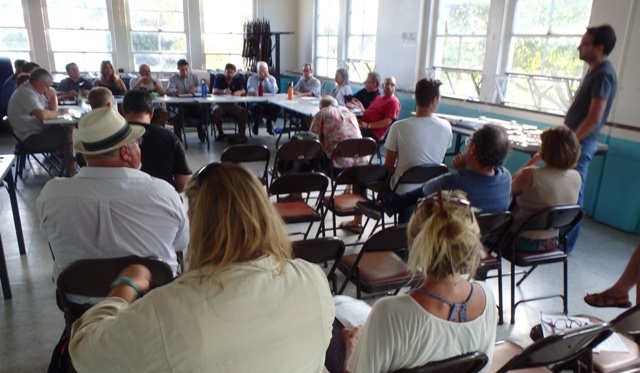 At last night’s meeting, the Ocean Beach Planning Board approved by a wide margin a new development at the intersection of Voltaire Street and Abbott Street. The development includes three 2-story houses with a modern “contemporary design”. The Board also made two appointments – and now the OB Planning Board is at full strength with 14 Board members – the first time in many years. The September 3rd monthly meeting of the Board was gaveled to order by Chair Pete Ruscitti. The first thing up was an agenda change and Ruscitti did a mea culpa and had to remove Action Item # One – the “condo-ization” of the Quigley Complex at 5151 Long Branch Avenue, due to a noticing problem. It will be heard next month. During the public comment time, Nicole Burgess got up before the Board and informed the room that there are “rumors” that the City is considering installing a Stop Sign at the corner of Newport and Abbott. Nicole said that a round-about would be better. She added that the City is looking into placing a round-about at the “terrible” intersection of West Pt Loma Avenue and Bacon Street. Burgess is the rep for District 2 on the City Bicycle Coalition. Kathy Stadler of Nextdoor was next and she wanted to get the word out that her group is in OB, and has seven “neighborhoods” that reflect the OB Planning Area districts. This author was next and suggested to the Board that the week after the heaviest day at the beach – Monday, Labor Day, was not the best time to cut the lifeguards, which the City did this week. “The crowds will still be there, the dangerous rip currents will still be there, but the lifeguards won’t. It’s a community health issue,” I implored the Board reminding them that they have some jurisdiction over public facilities and services. District 2 rep Chet Barfield then made his usual announcements. He was working with the Friends of the OB Library and said he wants to assist them in fund-raising and putting pressure on the City to get the OB Library improvements back on schedule. OB was promised a new library a decade ago – using the historic core of the present site – but building a two-story facility. The City already purchased the building next door in anticipation a few years ago – but all before the recession hit – and everything about the new library for OB was place in a file drawer so deep that the City forgot about it. Chet didn’t have any new info about when the OB Community Plan goes before the California Coastal Commission – sometime in October. Sadly, Barfield had to announce that the OB Entryway Project will now take longer to complete – and now won’t be finished until November. The good news is, he said, that there will be additional things built during this phase, and there won’t be a need for a Phase 3. Barfield said that now landscaping, permanent paths, fencing and lighting will be installed. Unfortunately, he added, there is still no sidewalk connection to Robb Field – which has been a sore point of contention. Presently, there is no way to access Robb Field from the Entryway site – despite their proximity. Lastly, Chet said that $8,000 “has been found” to expand the seemingly successful Security Patrol, a 3 month experiment that just ended. “The seawall seems better,” he said. As there were 2 vacancies on the Board, the Board made two appointments of individuals who had applied and collected their required number of signatures from residents of the districts they wanted to be appointed from. And fortunately, both men appointed Wednesday night are renters – part of the “85%” of OBceans. The Board has been light on having renters on it – as most members are homeowners or businesspeople. The Board appointed Dan Dennison to District 1, who has been a land and community developer. Upon questioning, Dennison stated that “the character of a community is a paramount factor” in balancing the community’s character with property rights. Also appointed was Mike Nieto to District 5. He told the Board that he knows CEQA and is a “wetlands specialist” and “native landscaper”. He got to know the District, he said, while canvassing for signatures. He said that the people in his district are “intelligent, feisty, and proud to live in OB.” He brought a laugh when he added that he “fought for every signature”. With the appointments of Dennison and Nieto, the Planning Board now stands at full strength – 14 members – 2 from each of OB’s seven planning districts. The Board has not been this full for many years, as it has operated during a lull in building during the recession with anywhere from 10 to 12 members. 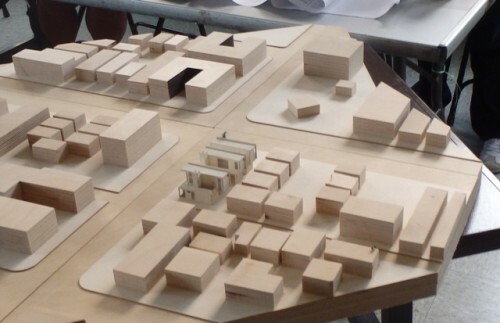 The models: white-colored structures are the proposed 3 units. After the applicants’ presentation, the Board had a lively discussion of the three planned residences at the southeast corner of Abbott and Voltaire Streets. The Project Review Committee had been split on approving, recommending approval by a 4 to 3 vote. Several issues were in play. The main one was parking. As is, the application has 5 parking spaces, and includes a “lift” for the vehicles – called vertical tandem parking. Another issue was allowing the applicant to have a curb cut which would give more space for two more parking spaces – but remove up to 2 public parking spaces on Voltaire. A large third issue is whether the units – all of whom have a downstairs “office” space with a full bathroom – are classified as “one-bedroom” or “two-bedroom” residences. Another issue was whether the proposed design fit into the community’s character. Artist’s rendition of proposed project. The Board had a great discussion on all these issues. In discussing the different options, it came to be known that part of the problem was that the City’s Traffic department described the units as 2-bedrooms due to the downstairs “office”. But the City’s Planning department said, no, these are one-bedroom units. It matters because required on-site parking is tied to the number of bedrooms. If one-bedroom, then there would only have to be 5 on-site parking spaces, but if 2-bedroom, it rises to 7 spaces. The applicant also wanted to have a curb-cut on Voltaire to allow better access to the lot (there’s a rough illegal one there now). But a curb-cut would remove one and possibly two parking spaces on the street – public parking spaces. City code allows curb-cuts if a property has a minimum of 150 feet of frontage but the Community Plan requires parking access via the alley. Yet, some of the Board members noted, the public would lose 2 spaces, but if the curb cut wasn’t allowed, there would be additional demands on spaces by residents of the proposed project. But the public would “benefit” because with the curb-cut, the developer would add two more parking spaces – for vehicles that would normally have to be parked on the street. The issue of the number of bedrooms is important. Board members mused that even if the residences are called “one-bedroom” the downstairs office with full bath could easily be turned into a bedroom – and that knowing OBceans, it probably would. Two bedroom residences require more parking. On the other side of this issue, is that the “office” is the room where the front door is located, so upon entering the building, you’re in the office and it would be inconvenient to have that room as a bedroom. Upon questioning, the applicant admitted upfront that he plans to “condoize” the units at some point. Board members also responded that the units would probably end up as rentals – despite one of the applicants saying he planned to live in one of the units. The expected rent would be $3,000 for each unit. In terms of design, a couple of the Board members thought it was “not harmonious” with the surrounding character of the neighborhood, whereas others felt the design was a nice transition between the bulking apartments of lower Voltaire and the single-story cottages to the east. A motion was made by Jane Gawronski to approve the application as current made – with 5 parking spaces – and with a “strong recommendation” from the Board asking for the curb-cut / driveway. The vote came down: 11 for the project, 3 opposed, and no abstentions (even though there were 2 newbies on the Board). The “no” votes were by Scott Therkalsen, Tom Gawronski and Rae Hartigan. This author felt that the Board’s discussion on this project was one of the best that I’ve experienced at a Planning Board meeting. Everyone was engaged, civil, and all the different options were explored. Ruscitti sat back, and allowed for the discussion without the formal – and at times – restraining confines of rigid rules of order, and he would then attempt to summarize what the other Board members were saying. The free flow of the give-and-take was able to be fluid enough to raise every angle. A succinct summary of the night. Thanks, Frank. If I can nitpick: the project team does not intend to live in one of these units as you pointed out. I tried to be clear about that point. We intend to keep one in ownership of the partners involved in the development. I’m disappointed that the OBPB approved what are obviously two bedroom units without the required parking. As I said before, why does a one bedroom unit need an office space that size with a bathroom? My prediction is that these will be rented as two vacation units, one upper and one lower, or simply as two rental units. Separation of the units and adding a kitchenette are easy. The entrance issue is easily dealt with as well. It’s no surprise that DSD wants to call these one bedrooms, kudos to the traffic department for telling it like it is. To be fair, if the City takes the board’s recommendation, these will be sufficiently parked as 2-bedroom units, albeit at the expense of 1-2 public parking spaces (per the curb cut that the 150′ frontage allows for). I agree they will likely function as 2-bedroom units, although I don’t think they can and will be separated as easily as you are saying. Speaking only for myself, I do believe that questions about the parking and the potential for being 2 bedroom units are quite valid. Despite voting for the recommendation that was approved, I am not that comfortable with the loss of 1-2 street parking spots. It’s easy to frame these kinds of projects as developers trying to get over on people and circumvent the rules to maximize their personal gain. Anyone who has been involved with the development process has seen that many times, and this project arguably walks a fine line there. What I have seen at least as much, however, and probably more often, is owner-builders getting swept up in a maze of rules and codes and policies that are often nearly impossible to navigate – and especially so if you stray from building the same cookie-cutter Spanish Mediterranean crud that gets built all over Socal. It’s not unusual for applicants to get 10 different answers from 10 different people on the same issue during permitting, and for the City to make the default answer “no” on anything ambiguous per their own liability concerns. In my view, when we make it that impossible to build anything, these creative owner-builder types get choked out, and the only ones who can do it are the big developer types or the ones who threaten lawsuits just to push their projects through. That doesn’t entitle anyone to any special treatment, but I don’t see that as what is happening here. These applicants are not asking for any variances, are not building to a scale beyond most of the neighboring properties, and have stated a general preference to park these as 2-bedroom units provided that they get the curb cut that they are probably entitled to have per the code and their 150′ frontage. Beyond that, I am not really trying to get in people’s way, and especially not with regard to creative and unique designs that are, IMO, in line with OB’s eclectic and funky spirit. As usual, you have provided reasonable commentary. A few points. The fact is that without the curb cuts and additional parking, the public spaces would probably still be lost because the cars from the units would take the spots anyway. At least this way, some cars are off the street. More importantly is the larger picture of general infrastructure, roads, sewer, water that were not looked at as three two-bedroom units but rather three one-bedroom units. I have heard this complaint about the development process many times. You mention owner-builders bewildered by all the requirements. Most of the time, the reason for that is that they go into this with no knowledge at all about how the process works and then complain about it being difficult. That’s like doing a major mechanical repair on a car with no experience other than changing your oil and complaining that the car was put together in too complicated a way. The developers that do know the process also complain but they would complain about anything that controls what they want to build; this is an age old complaint. The requirements are there because the citizens wanted them in some form or another. I remember driving on a road outside a town somewhere in the northwest that was choked with signage like something from the 1950s. Miles of garish signs lined the road creating visual pollution. We have sign regulations here that were created to prevent this kind of thing. I don’t think we want to go back to the days when anyone could build anything anywhere, so we have a process. Maybe it could use some work, but these complaints don’t tell the story. Thanks for the comments, Geoff. Very good point about the impact on infrastructure. I thought that this was an important concern with our FAR fight in particular. I believe that they are allowed to have the 2-bedrooms here, provided that they can park them, although quite possible it results in less permitting fees, I suppose. Appreciate your tolerating my rant as well. I think these applicants seem pretty familiar with the regulations in play here. Unless they or we are misinterpreting or missing something else pertinent, which is quite possible, they may simply not be getting clarity on their driveway eligibility, which they do seem to have with 100′ on Abbott and another 50′ on Voltaire. I believe that the applicant and our chair also mentioned another means of their eligibility in the code that kind of flew by me. If this is the case, a lot of the concerns are kind of moot, IMO. They don’t have 150′ frontage. They have 50′ so they shouldn’t have a curb cut. You have to have a minimum of 150′ for a curb cut; if I’m correct it has to be the same developed parcel. I think 3 spaces is enough for these units anyway. I’d rather see less parking required for the beach area. Adding more parking only exacerbates more people driving and congestion. It’s like widening a freeway to allow for more cars but the unintended consequences its get congested anyway. When parking is restricted and more difficult people look for alternative modes. If we need more public parking lets put some parking structures in and charge $’s. There are 3 places they could go. We should evaluate OB’s on street parking as a whole to see how we could accommodate local residents with more spaces. There are ways that it can be done. I like the building design BTW. Glad they got approved. The property is on both Voltaire and Abbott Streets. This seems like a mixed bag. There is no question these units will not improve the already bad parking situation. The office thing is hard to gauge. Many people would use it as another bedroom and yet more cars. On the other hand I worked from an office off my front-door on Abbott for years. I travelled from there to client sites – it is not a good location if your customers drive to you. I’m not sure how much demand there is for office space in this area when there are so many other spaces available around Point Loma. Just FYI – the beach was in fact quite dead both on Tuesday and Wednesday. I really don’t see a need to keep all of the lifeguards on duty. I was the ONLY one in the lineup at Avalanche on Tuesday in the middle of the day. There were maybe a couple dozen people on the beach itself. Okay, neither day is the weekend; I foresee big numbers of beach attendees if the weather is any good on Sat and Sunday. Very true. I can see them being necessary for the weekends. Looks like it’ll be quite warm Saturday and Sunday. Oh, btw, how was Avalanche? That’s the spot I gravitate to around 11am if I’m in the water, as that’s when the surfers have to leave, and only bodysurfers and boogieboarders are allowed – and sometimes Avalanche is the only spot breaking. Avalanche was GREAT the last few days. Even the little stump jetty at tower 5 (some of us started dubbing it Pun de Perros) has been getting nice little 2-3 ft waves the last week from the SW and the winds have been light to moderate. Low tide right now is around noon I believe so if you plan on going out the next few days and can wait a bit I would wait for the mid afternoon tide push. I should add that the big SSW swell coming in tonight/tomorrow is going to likely wall off Avalanche through weekend so get your session in today if you can otherwise you’ll have to head to the cliffs or further north. $3,000 a month for a one bedroom ? Seems alil steep to me. And will this be one of the those great ads you see online bragging about being close to Dog Beach, but the unit doesn’t allow pets ? Ah, but how does it sound for a 2-bedroom with some views? Still overpriced by OB standards. Especially since they’re modular homes which are cheaper to build. But in today’s world, selfishness and greed are the new way of doing business. Where are the parking spots on the artists rendition? In the article it says a vertical lift. Where would they drive in? That lot is extremely narrow. Im very disappointed this was approved. So, I see nothing has really changed with the council…lame. The required parking is provided off the alley, behind the units. I am surprised to see no real conversation about upgrading this lot to a useful new clean small residential project from its current lowest and worst use as a dusty dirty vacant lot . This lot and the liquor store across the street comprise the twin eyesores on everyone’s walk or drive to dog beach. How great (and clean) has the beach gotten since they removed liquor and smoking and added the new showers and bathroom. Let’s always look to upgrade quality of life for our neighborhood first and foremost. Does “‘not harmonious’ with the surrounding character of the neighborhood” mean that every new place built in OB should look like the Silver Spray at the end of Narragansett? Talk about an eyesore. These places look nice and I welcome them into the hood. Though I can’t imagine paying that kind of money to live, well, in that hood. These units do not fit the character of OB. imagine if all along our coastline pop up these modern looking-little Italy type structures? Is that how you see OB? Sure, one or two here or there could be seen as unique and interesting possibly, but we are getting more and more of these close to the beach. $3,000 – you’ve got to be kidding! Variance – seems that they are asking for one due to parking space issue and curb cuts – speaking of parking either way you lose two spots. I live in North OB and I like walking by Pats liquor – it’s not an eye sore unless you are living in La Jolla proper. Parking structures? please NO! I am pretty sure the reality is that these units will function as 2 bedrooms, and for that much money, probably have people sharing both rooms just to make rent. This is OB after all, and that in that hood? Let ’em (or even require them, DSD) to put in the curb cuts and parking, or the tenants will be taking up more than the lost two public parking spaces. There are a lot of people who don’t drive much around here, or even own cars – but highly doubtful anyone who can pay that ridiculously high rent would not also own at least one car. Just wish more compact, but nice and affordable units – even nice studios – would be built instead of expensive units catering to the few with the cash. .. that said, I am speaking without having looked up the allowable density of the site.